Diagram a network, draw Computer Network Diagrams, Designs, Schematics, Network Maps with our network diagram tool - ConceptDraw DIAGRAM in a couple of minutes! Pre-drawn shapes representing computers, network devices plus smart connectors help design diagram network, create accurate network diagrams and documentation to be used in your network diagram project. ConceptDraw is a network diagramming tool that includes task-specific libraries of highly detailed, accurate shapes and graphics of computers, servers, hubs, switches, printers, mainframes, face plates, routers etc. for computer networks, telecommunications, wireless Internet, power, storage and other equipment. 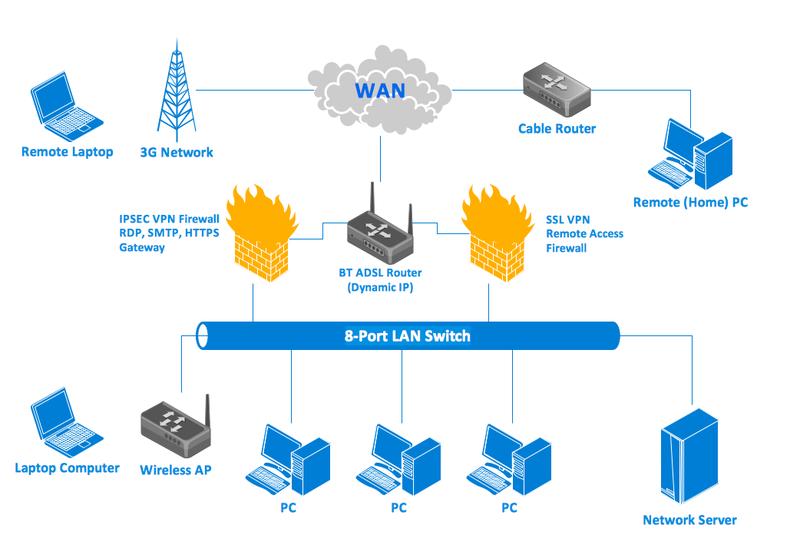 Network design tool ConceptDraw DIAGRAM provides a convenient way of connection network components with intelligent smart-connectors. To design a network diagram use handy quick-start templates supplied by ConceptDraw DIAGRAM (for example Basic Network diagram, Logical Network diagram, Active Directory, LDAP Directory templates and others). When you work on a network diagram project with such a tool it's helpful to use multiple layers to separate different areas of visibility. There are also hyperlinks for multi-page documents. After you have diagrammed a network you can export it to graphic formats as PDF, Power Point, Flash, and HTML with hyperlinks. The built-in ConceptDraw Basic scripting language is for custom integration of your diagram with any data sources. For CISCO specific network drawing diagrams, ConceptDraw DIAGRAM is supplied with CISCO specific diagrams shape library. 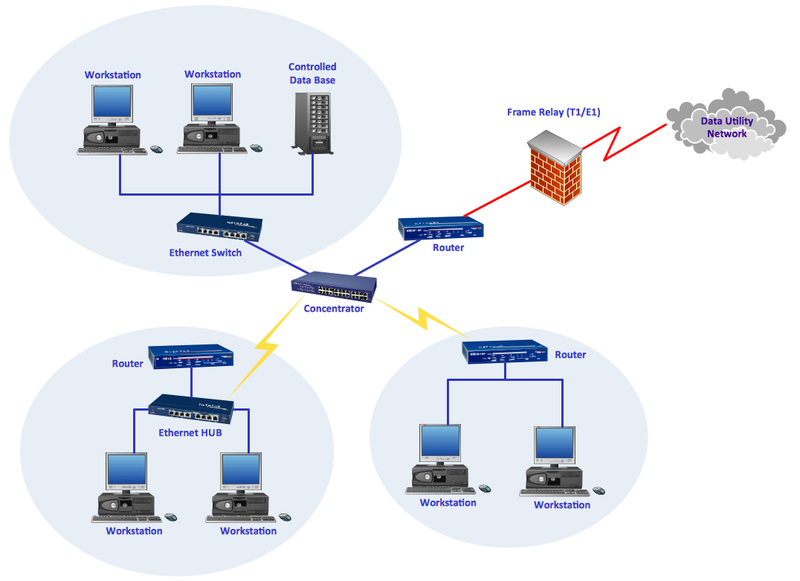 With ConceptDraw DIAGRAM you can draw a detailed network diagram where you can visually show the way network equipment is logically and physically connected and arranged in a room, office, or building. You can create a complex network diagram that consists of different Concept Draw diagrams, each with specified level of detail, connected by hyperlinks. You can easily connect network topology shapes by using smart connectors that can be visually attached to library shapes. After you have joined the device and connector your device remains connected even if you want to move it somewhere. You can store data, such as network name and IP address, manufacturer's name, product number, serial number, price and other information with the shapes. This information can be used in ConceptDraw Basic scripting language for automatic calculations. Also you can use ConceptDraw Basic scripting language for receiving up-to-date information from manufactory databases. ConceptDraw DIAGRAM makes it simple to share your network diagram project with others in a business presentation or on the web. Draw and design new directories visually changing the structure of already existing ones. Easily change location of your network drawing components, plan, update, and migrate programs by using the design of the directory structure. ConceptDraw DIAGRAM has all necessary Active Directory Sites and Service shapes, Directory connectors to show relationships between domains, sites, and services on the network. These shapes are designed to be used in planning a directory or a network, or for planning distribution and replication of information among different servers at different sites.